Update, May 9: We added the Samsung I9500 Galaxy S4 to the benchmarks, this is the one powered by Exynos 5 Octa. Qualcomm must be feeling pretty good - the HTC One and the majority of Samsung Galaxy S4 units (plus flagships from other companies) use the company's Snapdragon 600 chipset. This means we can expect similar benchmark scores, with a slight advantage for the Galaxy S4 due to the higher clock speed. The Snapdragon 600 chipset packs four Krait 300 cores, which are clocked at 1.7GHz in the HTC One and 1.9GHz in the Galaxy S4. There's also 2GB of RAM and an Adreno 320 GPU on both smartphones. The GPU clock speed is unknown but we suspect it's higher in the S4 than the One. Then there's the other Galaxy S4, the I9500, which uses an Exynos 5 Octa with four Cortex-A15 cores at 1.6GHz (the Cortex-A7 will shut off under the heavy load of the benchmarks), 2GB of RAM and PowerVR SGX544. The first batch of benchmarks tests CPU performance - first of a single core (Benchmark Pi) and then the full multithreaded performance (Linpack and Geekbench). The Galaxy S4 narrowly takes the single-threaded performance and gets a more comfortable lead in the multi-threaded tests. AnTuTu and Quadrant are all-inclusive tests that gauge pretty much every component (CPU, GPU, RAM, storage, etc.). 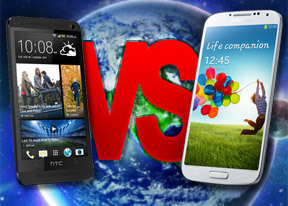 Both of them place the Samsung Galaxy S4 ahead of the HTC One by a narrow margin. With mobile phone screens topping FullHD resolution, GPUs are under more stress than ever. Luckily for the Galaxy S4 and HTC One, the Adreno 320 is one of the fastest around. The PowerVR SGX544MP3 is also blazing fast, it's used in the Apple iPhone 5. The GLBenchmark 2.7 test runs at 1080p resolution off-screen, meaning the actual resolution of the physical screen doesn't matter, so we can compare raw performance. The Galaxy S4 tops the charts here, beating the HTC One by good 4-6fps. The only mobile GPU we've tested yet is that in the Apple iPad 4, but that's a tablet and it's not a fair comparison really. Epic Citadel is a tech demo for the latest Unreal Engine, which is bound to see use in real world games. We ran the test in full resolution with performance set to quality. The Samsung Galaxy S4 and HTC One came very close in this test as both often hit the software limit of 60fps. Still, it indicates that both phones will run heavy games easily. Finally, we tested the web browser performance using the stock Android browser (both phones come with Chrome pre-installed as well). Winner: Samsung Galaxy S4. Samsung clocked the Snapdragon 600 chipset higher than HTC and helped its flagship to the victory here. The Exynos 5 Octa version of the Galaxy S4 is slightly faster with its Cortex-A15 CPU, but there's very little difference between the I9500 and I9505 in terms of performance. The HTC One is by no means a slouch - we doubt there will be apps or games that are too intensive for it anytime soon as that would mean they won't run on anything other than flagship phones.